Such a great breakfast treat for a fall weekend! Preheat the waffle iron. In a large bowl, whisk together the eggs, buttermilk, milk and butter. Stir in the apple. In another bowl, whisk together the flour, sugar, spice, baking powder, baking soda and salt. Add the flour mixture to the egg mixture; whisk until smooth (some small lumps are okay). Sprinkle 2 tablespoons pecans (if using) onto the waffle iron. Pour about 2/3 cup batter over the pecans. Cook the waffles until golden brown, about 5 minutes. Keep warm in 200°F. oven while cooking the remaining waffles. 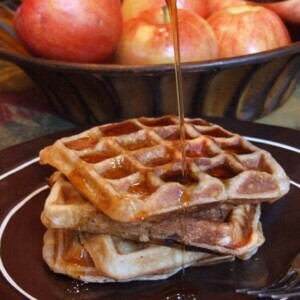 Serve with warmed maple syrup, if desired. *Extra waffles freeze nicely. Just warm them up another day by popping them in the toaster. *Since the addition of pecans is optional, they are not included in the nutritional information.